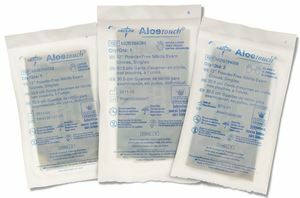 Aloetouch 12" Sterile Gloves are designed to use in places where latex-free and sterile protection is needed. Perfect to use in Burn centers, Pharmacies and ER/Trauma. Features beaded cuff for secure grip. Its textures surface keeps the gloves in place providing comfort to the users. Plastic keeps the moisture away. Aloevera coating helps your hands to be soft. Smaller packs consume less space and can be handled easily.